Since the 1990s, Central and Eastern Europe (CEE) has provided unique societal quasi-experiments, which represent opportunities to test the applicability of existing theories in international business and management studies and to develop new ones. Specifically, three lines of theorising have been advanced: (1) organisational economics theories; (2) resource-based theories; and (3) institutional theories. For each of these theories, we discuss how they contribute to the understanding of key issues, such as entry strategies of foreign investors, restructuring strategies of local incumbents, and entry and growth strategies of entrepreneurs. On this basis, we assess how CEE research has influenced the overall trajectories of theory development. CEE research has in particular highlighted the importance of contextual influences such as institutions. Thus, scholars have aimed at incorporating institutions into theories (such as organisational economics theories and resource based theories) and advancing an institution-based view of business strategy as a complementary perspective. We outline how future research in CEE and other emerging economies may advance this research agenda further. Meyer thanks support from the Centre for East European Studies at Copenhagen Business School and the Danish Social Science Foundation (Project No. 24-01-0152). Peng acknowledges funding from the Ohio State University's Centre for Slavic and East European Studies and Center for International Business Education and Research as well as the National Science Foundation (CAREER Grant SES 0238820, formerly known as a Young Investigator Award). Earlier versions were presented at the Academy of International Business meeting in Puerto Rico (2002), Henley Management College (2004), and the University of Nottingham (2004). We thank conference and seminar participants, JIBS reviewers, Arnold Schuh, Brian Silverman (editor), Klaus Uhlenbruck, and Mike Wright for helpful comments and discussions, and Jana Penzes, Yen Thi Thu Tran, Yuanyuan Zhou, and David Zhu for excellent research assistance. All views expressed are ours and not necessarily those of the funding organisations. In preparation for this article, we have systematically collected all CEE-related articles in 13 leading IB and management journals published during 1986–2004 (inclusive). They include 137 articles published by eight North America-based journals: the Academy of Management Journal (9 articles), Academy of Management Review (4), Administrative Science Quarterly (2), Journal of Business Research (8), Journal of International Business Studies (26), Journal of International Management (5), Journal of World Business (72), Organization Science (4), and Strategic Management Journal (7). 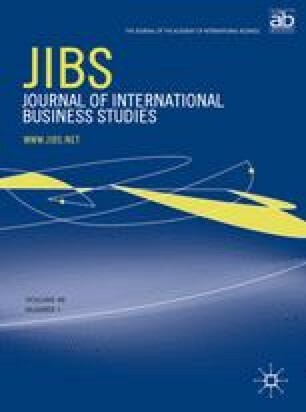 A total of 81 articles are published by four Western Europe-based journals: International Business Review (21), Journal of Management Studies (11), Management International Review (19), and Organization Studies (30). A full list of these 218 articles can be found in the literature review section of the JIBS website (http://copenhagen.jibs.net/LitReviewsInfo.asp). Table A1 reports some summary data on this diverse research. In columns 1 and 2 we report the leading individual and institutional contributors ranked in terms of the weighted numbers of publications in these top journals. Russia expert Sheila Puffer and her institution, Northeastern University, emerge as the most prolific contributors. Columns 3 and 4 list the most frequently cited papers in the SSCI database as of 31 December 2004. The most cited works include papers that cover both CEE and Asia, be it theoretical papers such as Peng and Heath (1996), empirical studies such as Child and Markóczy (1993), Ralston et al. (1997), and Hitt et al. (2000), or the introduction to a special issue by Hoskisson et al. (2000). The most cited papers analysing business in a specific CEE country are Frese et al. (1996) on worker motivation in East and West Germany [column 3] and Newman (2000) on enterprises in the Czech Republic [column 4]. aBased on 218 publications in 13 top IB and management journals published during 1986–2004 (inclusive). These journals are the Academy of Management Journal, Academy of Management Review, Administrative Science Quarterly, International Business Review, Journal of Business Research, Journal of International Business Studies, Journal of International Management, Journal of Management Studies, Journal of World Business, Management International Review, Organization Science, Organization Studies, and Strategic Management Journal. The first number is ‘adjusted’ giving partial credit for all coauthored papers, and the second number refers to an author's total number of articles. See Lu (2003) and Peng (2001b) for details of this method. bNumber of citations in parentheses, as of 31 December 2004, according to the Social Sciences Citation Index. cStockholm School of Economics includes faculty of both campuses in Sweden and Russia. Tabulating citations in this form is not without methodological problems. First, because we only systematically cover IB and management journals, we do not pay systematic attention to influential research in economics (e.g., Estrin, 2002; McMillan and Woodruff, 2002) and sociology (e.g., Stark, 1996; Ledeneva, 1998). Second, some influential research has been published as books, such as Peng (2000: 46 citations), Johnson and Loveman (1996: 23), Meyer (1998: 23), Estrin et al. (1997: 19), and Antal-Mokos (1998: 18). However, because books are not clearly identified in SSCI, we are unable to provide exact citation counts for all relevant books. Finally, the SSCI database as well as our own database has a better coverage of US-based journals than of European or Asian journals. Notably, there is no CEE-based management journal included in the SSCI database. This probably leads to relatively stronger ratings for scholars cited in North American journals, compared with those who may be influential within the CEE region.